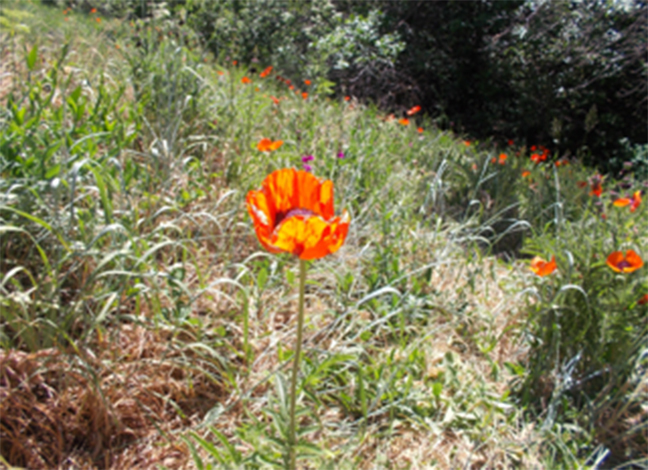 Erin Geegan Sharp: This hypnogogic and staggering vibrant red high-altitude Colorado poppy speaks volumes to me as a poet-playwright and to my work. Recent published works can be found in journals, including Fact Simile, RECONFIGURATIONS, Mental Contagion, and Bombay Gin. I also had the honor of my performance piece Mind Architecture being presented at a 2006 Performing Arts festival at Naropa University. I earned an MFA in Writing and Poetics at Naropa Univeristy and a BA in Communications and Sociology at Purdue University. Besides bringing poetry to K-8 students in the St. Vrain and Boulder Valley School Districts, my modus operandi is as Principal of Zam Energy, re-architecting solar energy using solar trees and the like—suspended poppy pod dreams aflame in the body electric. Erin Geegan Sharp is a contributor to Nerve Lantern issue 4.